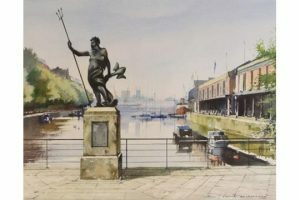 Bristol is my home town, and in the city centre just by the harbourside is a statue of Neptune stood proud as traffic, both pedestrian and motorised, incessantly whizzes around close by. Its location has moved slightly a few times over the last 30 years (and indeed, it has been sited around several parts of central Bristol since the 18th century), but its perspective has remained largely the same since the mid-20th century. Redevelopment and modernisation, including enlarged pedestrian areas and redesigned traffic flow, has seen the site change and move slightly since I became fond of it, but it’s there nonetheless! As a young man, I often used to wait there, lean on the railings and pause a while, having arrived deliberately early for meeting up with friends for a night out. Especially in the summer time, it’s just a nice spot to pause and watch the world go by. Given Bristol’s maritime past, and my fondness for my home town and pride in its heritage, a statue of Neptune overlooking a harbourside seems a strangely appropriate place to pause and reflect, and to feel a sense of belonging. I recently said to my wife that I miss having younger children and she agreed (at time of writing, our four children are aged 11, 15, 18 & 19). There’s something about the smiling happy faces of young children and the utterly honest affection given and received before the fog of teenagedom (!) and adulthood descend. Just around the corner from our house is our local park. 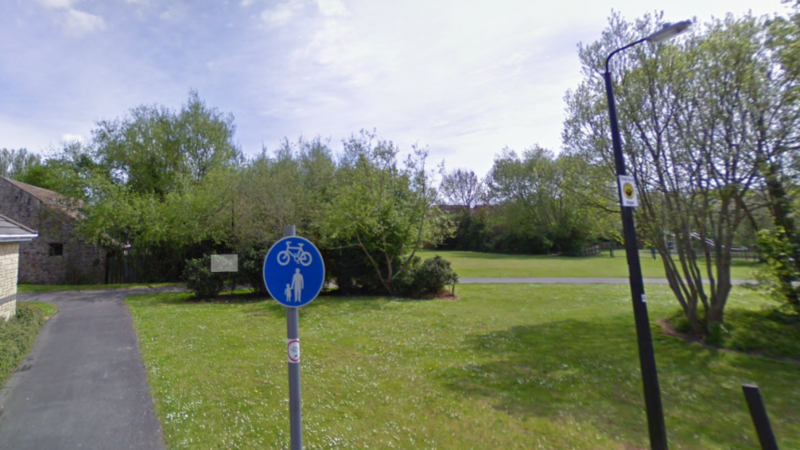 There’s a play area with swings, a path that’s a well-used thoroughfare to places we often need to go, and just beyond the play area is a large open space with a bench, a football goalpost for the local kids, and many a dog walker when the weather is nice! When my now 15-year-old son was only 7 or 8, I was a mature student and thus at home during the school holidays. During the Easter holiday in 2010, every day for a week or more he’d wake me up and want to go out with his football. We’d spend an hour or more practicing corners by the goal posts and playing football before going back home for breakfast. There would often be another visit later in the day too with his friends or visiting cousins. Fond memories indeed. Nowadays, I often walk past on my way elsewhere, sit on the bench whilst taking the dog out for a walk, or stand by the goalposts chatting to other dog walkers in the early evening sunshine. That place and its memories will always make me smile. Kingswood Leisure Centre, called Soundwell Swimming Pool during my teenage years, was bigger than all of the local suburban swimming baths around Bristol, many of which are no longer there. That and the big diving board were big attractions, and I loved going there when I could. A little further down the road is a Fish & Chip shop. I don’t know who runs it now, but the same family ran it for years and I was a regular on my Granny’s behalf as a teenager. Many years later, in my late 30s, I called in as we were in the area. The old lady behind the counter looked up and smiled and said “Oh, it’s Mrs Foley’s grandson isn’t it?”. Touching after so many years. Next door to the Fish & Chip Shop, set back a little bit, 66 Soundwell Rd is now home to “Express Signs Ltd”. For 40 years however it was my Grandad’s barber shop. After retirement they moved over the road to No.97, and it was a gas appliance showroom for a year or so. You could still see the outline of the words “Gents Hairdressers” in the dust on the shop front! It became Express Signs in the mid-1980s which it still is, and in a strange “it’s a small world” kind of way, the chap who has owned and run it is the father of my brother Tom’s girlfriend (!). Tom sometimes works in there with him, in what was our grandad’s old shop. It’s a short walk down the road to the local newsagent, always well-stocked with magazines and sweets, and larger than my own local one where I lived as a teenager. But before going that far down the road, just across the road was No.97 where my grandparents lived after retirement. After Grandad died, as childhood and teenage years gave way to young adulthood, I’d often enjoy hanging out with my Granny keeping her company on a Friday night, as much as I’d enjoy a night out at the pub with my mates! Chipshop on left, Auntie Nora’s flat & bus stop on right. There are so many memories in a 400m stretch of road. The Swimming baths, fond memories of grandparents, my Auntie Nora’s flat opposite the fish and chip shop, my Grandad’s old shop, and more. I almost bought a house in one of the turnings just across the road from the leisure centre once too! Whenever we drive down that stretch of road (not very often, as it’s on the opposite side of Bristol from where we live) I feel comfortable, like a loving arm around my shoulders. One Saturday about 15 years ago, I was on a bus going through the area on my way to a rugby game. I was early, so decided to get off at the bus stop near my Auntie Nora’s old flat. 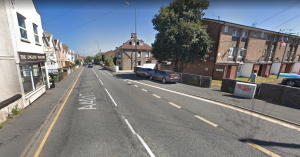 Crossing the road outside my grandparent’s old house, I bought a newspaper from the shop, bought myself some lunch from the chip shop, and sat on the wall eating my chips and watching the world go by, before getting on the next bus and completing my journey. It’s an ordinary stretch of road in Bristol suburbia, but its special to me! Last but not least, in the summer time there’s no nicer place to sit and relax on a summer evening, quietly reading a book, having a beer with mates, or a coffee with my wife, than the patio at the bottom of our garden. 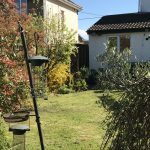 Other posts on this blog pay tribute to my wife as gardener supreme, but I have to say again that all her horticultural efforts have seen our garden evolve beautifully and the patio become a special place. I can honestly say that a reason I’m looking forward to summer is not just the weather improving, but the chance to sit on the patio with a book and a gin and tonic on a sunny summer evening! So there you have it. Four special places, all very different. A landmark in the city centre of my home town, a park where my children play / used to play, a 400m stretch of road in a Bristol suburb where my grandparents used to live and friends lived nearby, and the patio at the bottom of my garden that my wife’s hard work as made beautiful. All special to me in their own way. I’ve loved writing this as the reflection necessary has genuinely made me smile and feel warm. There’s been a lot of food for thought for future blog topics too. Where’s your special place? Think about it…you may enjoy doing so! Your post didn’t really make me think about places here in the States, but it did prompt me to remember a time many years ago when I shot pictures in St. James Park outside Buckingham Palace. There was an elderly man feeding ducks. The scene was so peaceful compared to the pageantry we witnessed at the palace. When I think of London, that’s what I remember. It was a happy time for me. Having spent time studying, living and working in London before moving back home I know how busy it is…especially the area you mention. Nice to find that even so centrally in one of the world’s biggest, busiest and most cosmopolitan cities, one can find some tranquility. There’s a few places in London I always enjoyed so perhaps that should be my next blog post! i don’t have any particular memories of special places at the moment, but reading your article it made me think of how much i value the parks by my home in Canada. with all the urbanization going on, a grassy field or a walkway free from heavy traffic are very peaceful and happy places i love to go through. I love reflecting on my childhood! Those places that are dear to you look wonderful. It’s so nice to take that time and remember positive, innocent memories of our youth. What an awesome trip down memory lane. Thank for reminding me to reflect back on special places. Many thanks Gina – glad you enjoyed it. This whole blog is a cathartic exercise and I particularly enjoyed this piece!